Are your drivers up-to-date? Check, download and install the latest drivers. 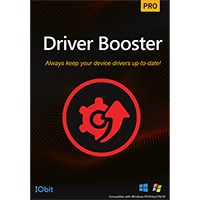 IObit's Driver Booster is a simple and straightforward tool which can scan your system for outdated drivers, then download and install replacements with a click. Upgrade to the Pro version and you gain additional features such as backup, faster download speeds and wider hardware support. The program is unusually easy to use. There's no complex interface, no searching around trying to decide what you need to do: just launch Driver Booster, it immediately scans your PC, and a detailed report appears a few seconds later. Or if you're in a hurry, just click "Update Now" and Driver Booster will download and launch each update. Thanks to a silent update mechanism, you no longer have to manually wade through each and every driver update package but do expect to reboot at the end of the process. It's incredibly simple to use, but more experienced users will find plenty of tweakable options available should they need them. Note that Driver Booster becomes the PRO version after you enter your activation code you receive with your order. The PRO version offers additional functionality such as access to a wider driver database, driver backup/restore, an auto-fix tool to check and repair driver errors, a game booster module and much more.